The opinion on Widow Mine so far has been divided. On one camp, it’s too overpowered. Conversely, it’s just right. This post is about how I feel toward Widow Mine after I have played approximately 20 to 30 1v1 games on Heart of the Swarm till this point. Additionally, it’s also based on the games played in IEM – World Championship. My stand is that Widow Mine is not too overpowered, but it’s nerfable. Based on the games I watched and played, Widow Mine features mostly in early game. As the game goes by, the number of Widow Mines produced decreases. Often, no one produces more Widow Mines than the few in the early-mid game. There are a few reasons for this. First, Widow Mine’s attack is spell damage and is not scaled with vehicle weapons upgrade. Another word, as the games gets longer, other units are more worthy to get than Widow Mine as they get buff from the investment spent on upgrades. However, it’s important to note that being a spell damage, it also ignores opponent’s armor upgrade. Thus, the second reason, which is linked with the first, is that making an Observer, Overseer or Scan is much easier when it enters into a macro game with multiple bases for both sides. Although the Widow Mine technically does the same damage as the game goes by, it’s easier to deal with them. For example, Protoss, with multiple Observers,can use Stalker and Colossus to clear the Widow Mines since they out-range it. The third reason is unit composition for Terran. Widow Mine is more viable for mech players as there are multiple factories and there is always at least one factory with reactor at all times. Thus, it is relatively easy to just stop producing hellion/Hellbat and make Widow Mines. In contrast, a bio/mech player needs to increase the tank counts for marine tank composition. The factory is always on tech lab, which makes Widow Mine production less efficient. Even when one has three bases, usually there are only two factories with tech lab for Tanks, and the rest of the resources are spent on Marine and Medivac. Perhaps, Widow Mine is more viable when the game gets beyond that and having a third or fourth factory with reactor becomes more affordable. Going back to the point that Widow Mine has been used extensively in the early game. In IEM, the LG-IM Terrans generally prefer builds which allow them to do pressure with Widow Mines into expansion. In early game, players do not have enough detection resources to deal with Widow Mines generally. Moreover, players have not figured out an effective way to deal with it. Personally, I have walked my Marines into Widow Mines in mid-late game many times. Clearly, it hurts, but it’s much less devastating than Tanks. Consistent with my early argument, I won every TvT whereby it’s Marine Tank mirror and opponent keeps producing Widow Mine. That is because I have a superior Tank count. Tanks are still better in positioning play and space control than Widow Mines. However, walking into Widow Mines of a mech composition may just shock you and it also gives away your positioning to the mech player. S/he can then re-position his mech units according. As for why I think it’s nerfable, it is down to my confidence in Blizzard’s Balancing team. I really appreciate their stands on balancing issues whereby they do not jump to action right away. They will observe for a longer period of time to allow the players to evolve and adapt to solve the problems themselves. So far, I have seen some innovative ways to counter Widow Mines in early game, for example, using hallucination to bait Widow Mine. Furthermore, they do not kill units. Simply nerfing units can kill them. They did a good job for Reaper in Heart of the Swarm. They encourage Reaper opening by reducing its cost, but ensure it does not deal huge damage like it did in Wings of Liberty. Widow Mine has come a long way to what it is since its first introduction. Blizzard never fail to remind everyone upon every tiny change done to it that, they do not want to nerf it too much that no one uses it. It’s easy for people who play into Widow Mine to just keep calling it op or “winnermine” . It is the same as labeling Tanks are op when you just run units into a group of Tanks which are sieged. If the Tanks do not crush the opposition more cost effectively in such situation, then no one will get Tanks. “How to nerf it?” is a difficult question to answer. Apparently, Blizzard is heading toward the direction of nerfing its splash damage. The current splash damage is just enough to kill workers (except SCVs), and hence, it is not wise to nerf the splash damage itself. However, the radius of splash could potentially be nerfed. I agree with you that it’s difficult to deal with for non-pro players. It can even deal huge damage to a pro if he’s careless with his Zerglings. That’s why I think it’s nerfable, but it’s tricky at the same time. As I have emphasized in the post, its effectiveness scales down as the game goes by, thus nerfing it too much might discourage players from using it altogether. Nerfing the splash radius seems like a plausible way to aid players to deal with it in the early game. Nevertheless, one of the main reasons why Zergs have problem with it apart from carelessness is their impatience to force their way out of the Widow Mines. I am actually impressed at how some players use Spore Crawler and Queen to zone out the Widow Mine. Do you think that it will shape up into a metagame whereby Zerg players are “forced” to make Spore and Spine Crawler in early game? you’re as wrong as wrong can possibly gets. protoss gets absolutely destroyed by these, it does 160 damage to protoss as well as going through hardened shield on immortals, one shots an oracle(detector). Terran scans and breaks observer, widow mine overruns protoss. Unlike terran and zerg, protoss can’t “mass” units. Stalkers are the most costly unit(based on supply and cost efficiency) in game and they can’t kill anything, I’ve once tried to use 6 stalkers to target down a widow mine before it burrowed… my result? couldn’t do it… stalkers are costly, silly damage, slow, and dumb. shove few widow mines at my pylons, warp one stalker = one stalker down. 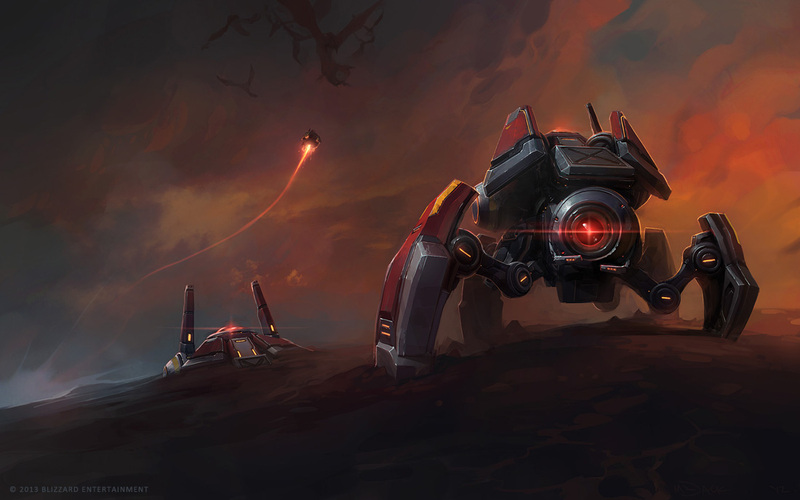 yea sure … zerg is already busy injecting larvae and spreading creep in addition to making workers and units like the other races, so why not add “watch out for widow mines” in their list of things to do as well? surely one more micro chore wont hurt. after all, terrans should be the only units that should be able to A-attack so all them terran boys can eat potato chips while in game.